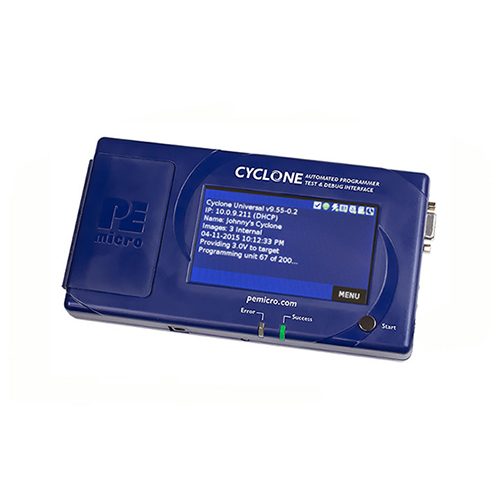 PEmicro's Cyclone programmers are powerful tools to in-circuit program, debug, and test MCU devices either in a stand alone mode or controlled from a PC. The programmers are reliable, easy to configure, and extremely simple to operate. Cyclone programmers provide on-board storage of programming images, provide power to the target, support manual or automated programming, support target serialization, and have an easy-to-use touchscreen interface. Programming may be launched by a single button press without a PC or automatically from a PC via the automated control SDK. The Cyclone may also be used as a debug probe during development. The CYCLONE_ACP supports a wide variety of ARM Cortex devices from many manufacturers. The CYCLONE_UNIVERSAL supports a wide variety of ARM Cortex devices from many manufacturers as well many non-Arm based devices including from NXP (S32, Qorivva (MPC5xxx), MPC5xx/8xx, DSC, S12Z, RS08, S08, HC08, HC(S)12(X), Coldfire, Kinetis, LPC), and STMicroelectronics STM32, SPC5, STM8. Auto-counting serial numbers can be defined as part of the programming image. The Cyclone increments and keeps track of the serial numbers in non-volatile memory.